As many of you know the iPhone is a powerful device that combines incredible sleek design with advanced graphic user interface technology. Millions of users rely on the iPhone daily to aid them in smoothing out the rough edges of life, but why not apply creativity to technology with a collection of attractive icons? Here are 15 absolutely free icon sets for the personalization of your iPhone courtesy of MakeUseOf! First off, you have to start off with the basics. iPhone icons arrive in two sizes, one of which you see most; the home screen icons are generally 59×59 pixels, whereas some icons can also be seen in 29×29 for list size; an example of the list sized icons can be seen within the iPhone’s settings area. The icons for each application on the home screen can be found in the bundles, which you can easily find on your iPhone’s /Applications folder. For example, for changing the Weather app icon, you have to place your icon.png in /Applications/Weather.app/, this will immediately overwrite existing icon.png. And there you have it! That’s how you can install an icon on your iPhone. Customizing your iPhone can be a fun way to put technology to an inspiring use. Let your iPhone reflect whatever you’d like it to and which icon set did you like the best? Feel free to leave us a comment below to share your valuable thoughts. 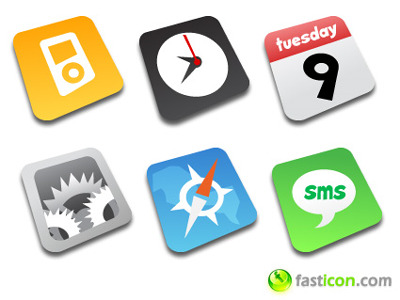 via Freebies: 15 Free Icon Sets for your iPhone | MakeUseOf.com.